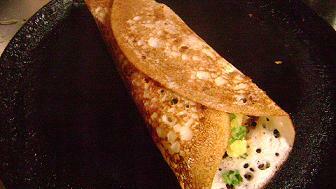 Masala Dosa is the most favorite breakfast in south India. 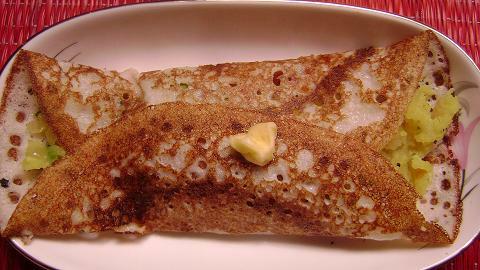 Masala Dosa wraps around an onion and potato sabzi, side dish can be sambar or chutney. I use the following proportion for dosa batter, it turns out to a very soft dosa. 1. Wash the above ingredients and soak them together for minimum 4 hours. 2. Grind them to a very fine paste. 3. Cover and keep aside for 6 - 8 hours/overnight. Heat oil in a kadai (deep pan). When it is hot enough add mustard seeds. When they start spluttering add urad dal, channa dal, green chillies, curry leaves and chopped ginger. Saute for 2 - 3 minutes (till dals are light brown ). Add sliced onions. When the onions are light brown in color and turmeric powder and fry well. Add boiled and mashed potatoes. Add salt to taste and mix well. Cover with a lid and cook on a low heat for 5 - 8 minutes. 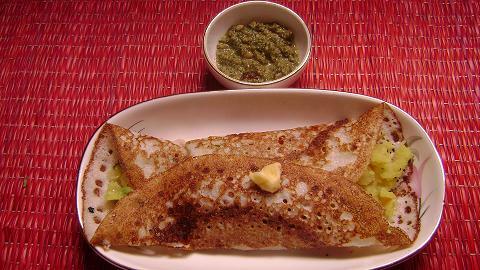 Remove the green chillies while dosa. Since Masala Dosa procedure is a long process, i just make this very simple. Mix Chutney powder/Chutney Pudi with little oil and water. So that you can spread it on the dosa batter. I have already mentioned about pudina chutney recipe. You can get the recipe from Pudina or Mint Chutney. 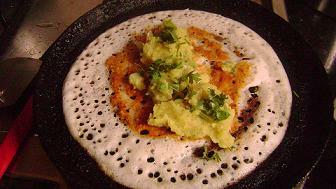 Heat a heavy - bottomed wrought iron griddle or non stick dosa pan on a medium heat. Grease with little oil / ghee. 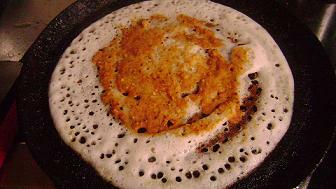 Make the dosa by placing a ladleful of batter on the centre. Spread evenly by circular rotations using the base of the ladle, starting from the centre and progressing outwards. Cover it with a lid and wait for 2 mins in medium flame. Spread the Red chutney on it. Place the masala ( filling ) in the centre of the dosa. 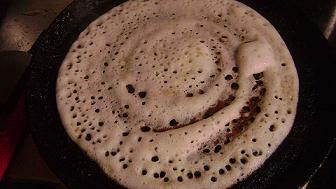 Fold the dosa and cook till crisp in low flame. When ready, carefully remove with the help of a thin spatula. 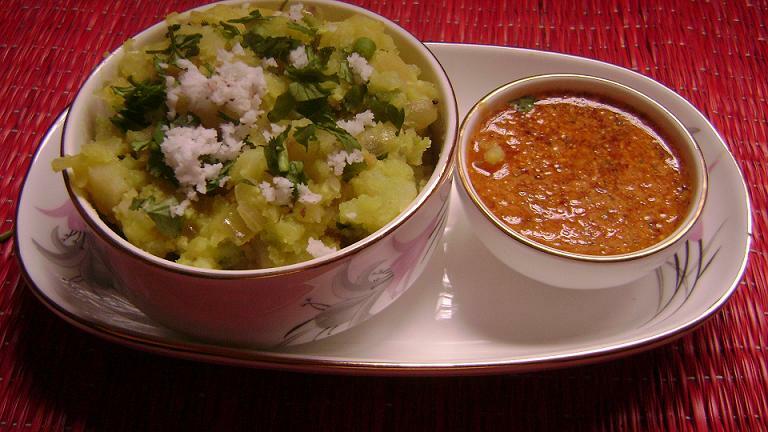 Serve hot with Pudina chutney.